How Much is Tim Duncan Worth? 3 time NBA Finals MVP, and 4 time NBA Finals Champion Tim Duncan has proven himself to be one of the greatest NBA players of all time. With 17 years under his belt Duncan has not slowed down. Despite talks of retirement next season Ducan’s only focus is revenge on the NBA Finals defending champions the Miami Heat. His stats and countless awards for his athletic ability explain his $10 million salary. Duncan was born in the Virgin Islands. Duncan displayed outstanding athletic ability at a young. He was inspired by his sister who was an Olympic swimmer to become an Olympian. But his dreams of swimming in the 1992 Olympics were crushed when severe weather ruined his family’s Olympic sized pool forcing Duncan to practice in the ocean. Duncan didn’t pick up basketball until he was 14 years old. He modeled his game after his idol Magic Johnson. In college Duncan’s dream of becoming the next Magic Johnson were become reality. In 1995 as a sophomore Duncan was considered one of the most eligible NBA prospects. He refused to leave school early to enter the draft. His mother was diagnosed with breast cancer when he was 14 years old and she made Duncan and his siblings promise they would finish school. Duncan did not enter the draft until 1997 after graduating with a Bachelors Degree from Wake Forest University. Tim Duncan signed a 3 year contract with the San Antonio Spurs worth $10 million in 1997. His earnings tripled after winning his first championship in 1999. He signed a $30 million contract for three years. He went on to win 3 more championships with the San Antonio Spurs in 2003, 2005 and 2007. 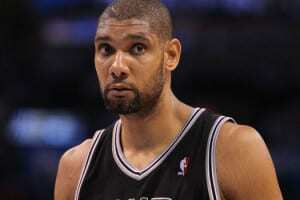 In 2013 Forbes estimated Duncan’s salary was $19.1 million including $2 million in endorsements. He landed on Forbes list at number 73 for the Highest Paid Athletes.